It is, as I write this, the day before Remembrance Day. I am looking to attending an elementary school Remembrance Day ceremony later this morning where my 10 year old son, Caden, has a solo singing part. Last year, it was older sister Morgan. There is an incredible poignancy of a child’s singing voice carrying a message of peace built on horrors that the child could be catching only a glimpse of. Thank you to our teachers, going above and beyond the curriculum to give our children the opportunity to participate in these ceremonies. “Simply showing up” with others at a Remembrance Day ceremony is important, but a deeper connection is achieved with participation. I had that opportunity on a nippy November 11th, approximately 25 years ago in Regina Saskatchewan. A reservist at the time, I had the honour of joining three other cenotaph sentries, each of us standing perfectly still, heads bowed and white gloves on the butts of our down-turned rifles. It was while I imagined my fingers developing frostbite when my own glimpse of the sacrifice of those who have served us became somewhat clearer. A different day of remembrance is just around the corner. The United Nations, in 2005, declared the 3rd Sunday in November as a World Day of Remembrance for Road Traffic Victims. The scale of carnage is staggering. Almost 4,000 people are killed and many hundreds of thousands are injured every single day in road traffic incidents around the globe. Canada followed suit. 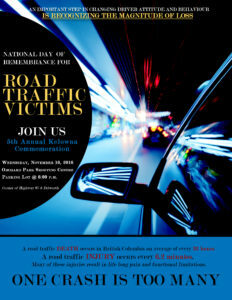 In 2008, we declared the 3rd Wednesday in November to be the National Day of Remembrance for Road Crash Victims. More Canadians have been killed in road traffic incidents than were killed in both World Wars. We have more than our share of carnage in British Columbia. Most recently published ICBC statistics show that one life is taken in this province every approximately 30 hours. A British Columbian is injured every 6 minutes. It takes more than “declaring” a day of remembrance. It must be observed. We must come to a complete stop in our lives to remember the victims of this ongoing tragedy, like we do on November 11th. Only then will the United Nations goals be achieved. It would take so very little to stop the carnage. We need only to change our driving attitudes and behaviours. We must catch a glimpse of the magnitude of the problem in order to motivate ourselves and others to be mindful of road safety every time we are behind the wheel. Is road safety important to you? “Simply show up” this coming Wednesday, November 16, 2016, at 6:00 p.m. for the fifth annual Kelowna commemoration of the National Day of Remembrance for Road Crash Victims. By doing so, you will be attending one of only a handful of commemorative events in all of Canada. It will be cold and dark in the Orchard Park Mall parking lot, corner of Dilworth and Highway 97, but we will have a heated shelter and Timbits to keep us warm. A brief ceremony starting promptly at 6:30 p.m., with short safety messages delivered by members of emergency services and others, will be followed by a minute of silence broken only by the rushing sound of traffic at one of the most dangerous intersections in Kelowna. Please bring your children. Driving attitudes are formed long before a young person sits behind the wheel for the first time.